Bogart plays a cold-hearted tycoon whose sole companion in life is The Wall Street Journal. 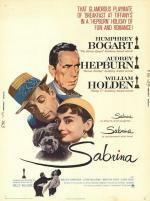 Holden is his wastrel brother, and Hepburn the chauffeur's daughter. Yes, you've guessed what happens. Holden fools around with her, she attempts suicide, is sent to France, returns to melt Bogart's heart, and Holden is left to chair the board.